Although Morgen and I used to live in France and have distinctly francophile tendencies, we also have tremendously warm feelings for Germany—especially Bavaria, which we’ve visited several times. A recurring theme in the sights we saw there—and believe me, I mean this in the best and most complimentary way—is wackiness. I’m not just talking about lederhosen and sauerkraut either, though it has always puzzled me how such things came to exist. A particular slice of German history we became well acquainted with was the rule of Ludwig II, king of Bavaria from 1864 until his death in 1886. While the many stories about Ludwig are strange and colorful (and some are featured as Interesting Things of Other Days) his most famous follies are the castles he built—especially his grandest and best-known castle, Neuschwanstein. Neuschwanstein is a beautiful castle set in one of the most scenic locations on Earth. If it looks a bit familiar, that may be because Walt Disney used it as inspiration for Cinderella’s Castle at the Disney theme parks. It really does evoke images of fairy tales, in more ways than one. But the story of its origin is one of tragedy, despair, and outright weirdness. To understand the story, you’ll need to know a bit about Ludwig. As a child, he loved swans. This is not surprising, considering the castle he lived in was called Hohenschwangau (or “high region of the swan”) and contained artwork depicting the story of Lohengrin, a medieval knight of the Holy Grail who rescues a princess with the aid of a swan. Ludwig liked to feed swans and draw pictures of them, and when at age 13 he heard of Richard Wagner’s opera “Lohengrin,” he was very excited. He memorized the entire libretto, and this led him to an interest in Wagner’s other music and writings. Within a few years, this interest turned into an obsession. In 1863, Ludwig got a copy of Wagner’s The Ring Cycle. In the preface, Wagner talks about “the miserable state of the German theater,” and that “a German Prince would need to be found to provide the required funds” to produce the opera. Ludwig took this as his personal mission. The very next year, at age 18, Ludwig became king when his father died. His first official duty was to send for Wagner and have him brought to Munich. Wagner, who at that time was in his fifties, was a gifted musician but not, apparently, a very nice guy. History records Wagner as arrogant, self-centered, and prone to excess, indiscretion, and intolerance. It so happened that at the very time Ludwig summoned him to Munich, Wagner was trying to evade his creditors and was very much in need of a patron. So Ludwig and Wagner struck up an almost symbiotic relationship. Ludwig funded Wagner’s work and put him up in a handsome villa, and Wagner played the part of mentor and idol. Not long thereafter, though, amid reports of yet another affair and worries that Wagner might be exerting too much influence over the young king, he was forced to leave Bavaria and move to Switzerland. Although Ludwig was upset, he continued to support Wagner, and the two kept up a steady correspondence. Meanwhile, Ludwig was not having a very good time as king. He lost an important war against Prussia, was forced to submit his army to Austrian control, and then ended an unhappy engagement. Depressed and bitter, he withdrew from the public eye as much as possible and consoled himself by planning the construction of several great castles. 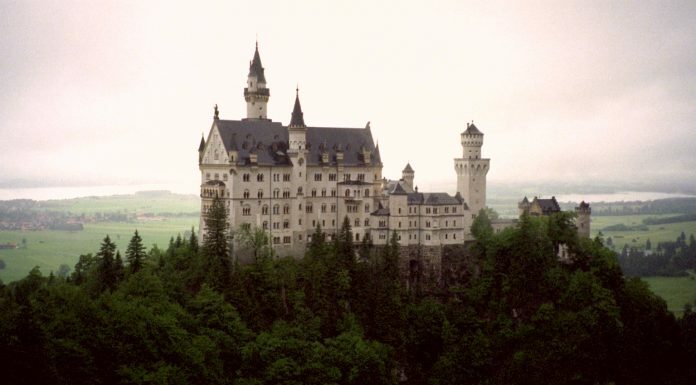 In 1869, work began on his most ambitious castle, Neuschwanstein (which means “new swan stone”). Around the time construction began, estimates were that Ludwig would be able to move into the castle within about three years. But the work proceeded at a painfully slow pace and more than a decade later, the castle was still not complete. In 1883 Wagner died, causing Ludwig tremendous grief. So the composer never actually set foot inside the castle that had been built in his honor. A year later, Ludwig decided to move in, even though the structure was still unfinished and the throne room was not yet ready to hold a throne. But the king resided there for a grand total of only 11 nights. After Ludwig died under suspicious circumstances in 1886 at the age of 41, construction on Neuschwanstein continued for another eight years. When the builders finally stopped, only a third of the rooms had been finished and decorated. Without Ludwig, Wagner may never have achieved the successes he did, and without Wagner, Neuschwanstein would never have been built. But there is much more to the story of the life and death of King Ludwig II than Neuschwanstein. The “swan king,” as he is sometimes called, built other equally interesting castles and led a fascinating, if deeply troubled life. His story, like his castles, reminds me that there’s more to Bavaria than meets the eye. Note: This is an updated version of an article that originally appeared on Interesting Thing of the Day on May 1, 2003, and again in a slightly revised form on August 16, 2004.